Gather family and friends around your Passover table and enjoy one of these delicious recipes from FreshDirect employees. Susan Schreiber, Director of Catering, Bakery & Pastry, got FreshDirect’s unique charoset recipe from a FreshDirect employee named Jessica Warren. Jessica told Susan about her grandma Nunu’s recipe and how it was unique because it included almonds instead of walnuts. Susan made the recipe and loved it so much it became the recipe we sell to our customers today. 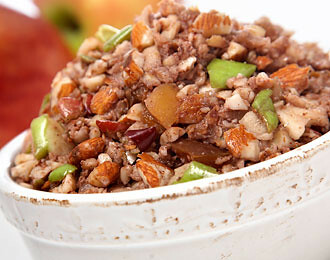 Based on Grandma Nunu’s tasty blend of both red and green apples, chopped almonds, dates, red wine, a dash of earthy ground cinnamon and a touch of tangy lemon juice, this traditional Passover mix is a seder plate essential, and a delightful dish all on its own. A kid-favorite, we love to pile it high on matzo crackers. Order it now or make your own with this ingredient list. Our VP of Brand Experience, Lisa Kolodny, shares a sweet kugel recipe that has been passed on for generations in her family. The best part about this recipe is that it’s easy enough for kids to make with you. Preheat oven to 350 degrees. Grease lasagna pan. Put matzo into large bowl and break into small pieces. (This is a good job for little children to do with you). Add some warm water to soften the pieces. Let matzo soak up water. Then squeeze out excess water so you have mushy matzo pieces in the bowl. Beat eggs, add sugar, cinnamon, raisins and add to matzo. Then add applesauce. (If the mixture feels too wet, you can add one or two more matzo – it should not be runny). Pour mixture into pan and spread across entire pan. Sprinkle extra cinnamon and sugar on top. Bake until mixture is set (firm but not hard) and golden around the edges, approximately 30-40 minutes. It can be served warm or cold. From pre-made meals to Seder Plates, get all your Passover essentials here.